Feb. 13, 2017 - U.S. softwood lumber was again the main global growth market in 2016 (the case since 2010) and supported firm to rising prices throughout the year. As usual, there are many change factors at work that will lead to unpredictable swings in lumber supply, demand and prices in 2017 and beyond. The largest market variable in 2017 is pending export duties on Canadian lumber shipments to the U.S., which consensus opinion estimates will come in at least at 25 per cent starting in about early May. The duties will cause huge disruptions and volatility in 2017 as the market tries to determine the price of lumber imports and U.S. domestic species. The following excerpts from WOOD MARKETS 2017 – the five-year solid wood products outlook (2017–2021) address some of the important lumber market developments expected in North America over the next two years. Both the U.S. economy and housing starts continue to improve, although at a relatively slow pace. Unemployment is declining and home foreclosures are much closer to historical rates than ever – all good news. New residential housing remains on a slow but steady upward trajectory and should reach 1.17-1.18 million units in 2016 (note: unlike in 2015, growth in single-family homes in 2016 is much greater than its multi-family counterpart, which creates higher lumber demand). Stocks of both new and existing homes have retreated to historical levels, but prices for new homes continue to move up in many markets, and in some cases are higher than those seen in the pre-2006 crash. With a shortage of building lots and strong credit ratings required for new-home purchases, the tight inventory has fostered rising prices. The five-year WOOD MARKETS 2017 housing forecast is still very conservative: we do not foresee U.S. housing starts reaching 1.5 million units until 2020 or 2021. Even with this expected slow growth rate in housing starts, however, the market is expected to get very active starting in 2019 – again, this is without factoring in U.S. export duties on Canadian lumber shipments. Based on both improved housing starts and strong gains in R&R, lumber consumption, led by new U.S. residential construction, will continue to accelerate from the levels achieved in 2016. Total U.S. lumber consumption is expected to rise strongly, moving from about 48 billion bf in 2016 (nominal) to 49.7 billion bf in 2017 and over 52 billion bf in 2018 (+9.7 per cent growth from 2016). In Canada, total apparent lumber demand has rebounded this year to an estimated at 8.2 billion bf (+2.5 per cent from 2015); slow growth is anticipated going forward given the country’s stable housing market. As mentioned, the biggest factor impacting lumber markets for 2017 and beyond in North America will be the implementation of U.S. export duties on Canadian lumber shipments, including the initial rate of the countervailing (CV) and anti-dumping (AD) duties. As we have reported over the years, any American complaint is difficult to rationalize given that reduced lumber production from the B.C. Interior will occur anyway, and eastern Canadian output will near its peak in the next few years and remain well below its 2004 peak. This means that Canadian production will naturally be flattening out during a period of strong U.S. lumber demand. While the issue is complex, it appears to WOOD MARKETS that the American position is less interested in looking at the facts and instead is prepared to use elements of U.S. trade law to marginalize its largest competitor. Nevertheless, our base case forecast assumes a combined 25 per cent CVD and ADD starting in Q2/2017; we have also prepared three other analyses (0 per cent, 15 per cent and 35 per cent). From recent discussions, we think there is a growing probability that preliminary duties could be more in the 35 per cent range. The higher the duty, the greater the short-term impact on Canadian lumber exports to the U.S. – as well as on trends in Canadian and U.S. production for the balance of 2017 and for 2018. Starting in 2019, we expect to see a growing shortage of incremental lumber in the U.S. that will allow Canadian lumber exports to its southern neighbour to start rising slowly going forward. This will occur despite a ramp-up in U.S. production and an expansion of European lumber imports (likely to follow the implementation of export duties on Canadian lumber). The production increases in the U.S. will be subject to many factors, such as log supply and costs, financing, supply chain factors, etc. This means we could see varying regional supply responses, e.g., in the U.S. West versus the South, etc. As WOOD MARKETS has been forecasting for the last few years, toward the end of the decade there should be a potential softwood lumber supply shortage versus U.S. demand to foster a more normal supply/demand balance, with or without U.S. export duties. While slower housing starts have delayed any potential “supply gap” over the last few years, the burden of export duties on Canadian lumber shipments to the U.S. will exacerbate the situation sooner. Translation: incremental supplies of logs and lumber will be required by about 2019 and beyond, and they will need high prices to become available; in 2020 and beyond, even higher prices will be required. moving from about 48 billion bf in 2016 to 49.7 billion bf in 2017 and over 52 billion bf in 2018. North American production continued to expand in 2016 (as it has since 2009) as a result of growing U.S. demand in housing and all other end-use segments. In 2016, currency devaluations limited exports for both U.S. and Canadian companies due to higher prices being available in the U.S.; this led to the fourth consecutive year of declining net trade (from 10.2 billion bf in 2013 to 7.0 billion bf in 2016). Reduced exports and rising output from North American mills meant more shipments were directed at the U.S. market; there was also an increase in offshore imports. With some 40 plus Canadian-owned mills situated in the U.S., and given stronger prices in 2016, a flurry of capex projects to expand production are combining with some greenfield/brownfield mill projects to add incremental lumber output. Exacerbating the issue is the impact of extra mill shifts and the re-opening of some curtailed mills. Canadian lumber production has continued to rise from its bottom in 2009 and should reach 28.7 billion bf in 2016; this is some 2.2 billion bf higher than in 2015, although well below the 2004 peak of 35.2 billion bf. Lumber output from the B.C. Interior was flat between 2011 and 2014, but grew in 2015 and 2016 to reach 12.2 billion bf. Assuming U.S. export duties are effective May 2017, a more rapid decline in lumber output is likely to occur as reduced sawmill margins make processing of older or dead MPB logs less economically viable. It is likely that exports to Asia will grow, but volume gains are expected to be small given flat market demand in Japan and the fact that CLS (dimension) sizes will have limited upside in China due to anticipated low growth rates in construction. Ontario and Quebec also continue to face longer-term timber supply issues as a result of legislated reductions in harvesting limits (annual allowable cuts) on government lands. In addition, the closure of several pulp and newsprint mills has negatively impacted chip prices in some regions, and these closures will persist. However, lumber production continues to rebound in the East from the lows of 2009; in fact, during the last few years, North America’s largest percentage increases have been achieved here simply because this was that last region in North America to restart curtailed sawmills. 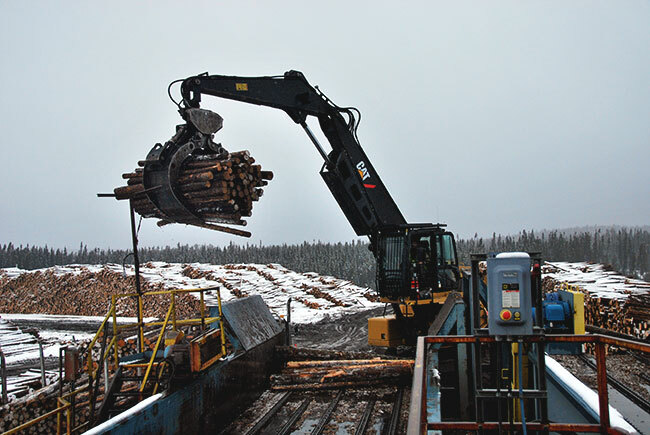 Eastern lumber output (including in the Atlantic provinces) grew by more than 17 per cent in 2016 (to 10.5 billion bf), the result of favourable U.S. market prices and increased capacity starts. By 2017, eastern lumber production could reach almost 11 billion bf, with a slowdown expected in the second half of 2017 and into 2018 as U.S. export duties hit their mark. Canadian exports to the U.S. soared to 15.5 billion bf in 2016, a bone of contention for the U.S. Lumber Coalition even though U.S. lumber prices remained buoyant during the year. The situation will correct due to U.S. export duties (based on a 25 per cent rate), moving toward 14 billion bf by 2018 – a drop of 1.5 billion bf from 2016. This reduction in exports will occur even though U.S. housing starts continue to rise, and the outcome will noticeably impact both supply and price volatility. As a consequence of the expected U.S. export duties on Canadian lumber in 2017, total softwood lumber production in Canada will decline; mill closures in the B.C. Interior will likely accelerate due to weak MPB sawmill economics, and curtailments are probable at higher-cost mills, especially in Eastern Canada. The supply response from U.S. mills could take time to kick in, causing lumber prices to rise to offset the Canadian export tax and fill any supply gap. This will lead to some unwanted volatility as sellers and buyers alike try to figure out whether or not the market is balanced. Offshore imports of structural lumber will play an expanding role over the next five years, with European lumber imports likely to soar as U.S. lumber prices rise to reflect both the export tax on Canadian lumber and the devalued euro. The export duties should easily provide the necessary price increase currently required by Europeans, opening the door for all of Europe (and even some Russian supply) over the next five years. Total North American output is projected to be near 61.6 billion bf (nominal) in 2016, and is forecasted to grow to almost 65 billion bf by 2018. The lion’s share of this increase will need to come from U.S. mills, whose shipments are projected to grow from around 33 billion bf in 2016 to more than 36.8 billion bf in 2018 (almost 12 per cent, which we believe will be a difficult target to reach). Although already limited by tightening timber harvests in the B.C. Interior and Quebec, Canadian shipments are projected to decline by 5.5 per cent from 2016 to 2018, while U.S. exports will slip by 8.8 per cent. 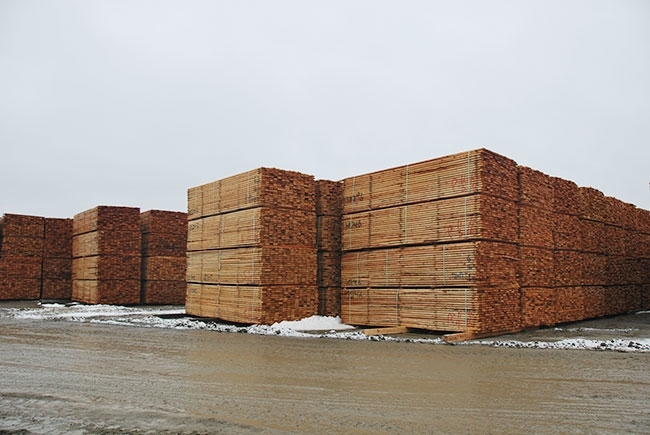 With the implementation of a U.S. export tax on Canadian lumber shipments to the U.S., discussions about a lumber price “super cycle” can now be resumed. With Canadian lumber production and exports to the U.S. beginning to become constrained, timber supply reductions and a lack of sawmilling capacity in North America are now looking more visible. Even without steady to stronger global lumber demand over the next few years, timber and lumber supply restrictions in North America may not balance out, and this puts a high probability on record-level lumber price by the end of the decade. As we have been saying over the last few years, high lumber prices have remained elusive as the global demand cycle slowed amid slow and steady increases in U.S. housing starts. Now, however, a pricing “super cycle” with “record high” prices – potential outcomes that have always had their roots in constrained timber and lumber supply – are now a much more feasible scenario by the end of this decade. The obvious catalyst: U.S. trade law and the impact of export duties on Canadian lumber. As a result, measuring the reaction of mills and the market to export duties on Canadian lumber exports to the U.S. will make 2017 a very interesting and volatile year! Russ Taylor is the president of International WOOD MARKETS Group, a wood products consulting firm based in Vancouver, B.C.